Tip 1: You must have probably come across the phase, ” Whatever you do, do not forget to enjoy it”, and that applies to playing tennis as well. When you are coaching young players, remember to keep them encouraged. You should train your tennis students in such a manner that they are happy and willing to come to tennis classes every time. 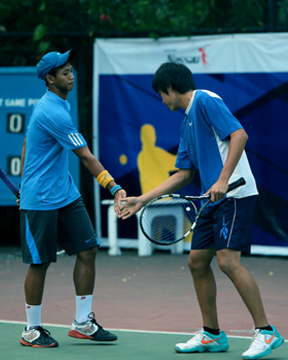 Tip 2: The second most effective tip is to customize the coaching as per the tennis students’ needs. For this reason, sometimes you may have to modify the equipments used in the sport. Rackets, court dimensions, net height and balls can also be altered to give the tennis students a more comfortable play. Tip 3: For the players to know where they are positioned, the use of markers by a coach is extremely important. You can easily guide the players as to where they should stand or hit with the use of cones as markers. Tip 4: When you coach students, it is important to teach them about the essential parts of the court and their names. By this the players will know how to communicate when talking about the game. Tip 5: For coaches who are helping new players, you must keep from using the tennis jargon for the first few classes. A lot of technical words all at the same time may confuse players and prevent them from having a clear understanding of the game. Tip 6: As a remedy to the tip above, coaches are advised to conduct the first few classes with the help of demonstrations. Furthermore, simple words like below, above, left and right can do the job quite well. Tip 7: Power and speed are important for tennis but a good coach helps players understand how to control the speed and use their power to the fullest. Targets should be well explained to the beginners. Tip 8: As coaches you must not teach students who are at a very young age. Children who are aged between 3-5 years cannot be coached well for their attention span differs from those older than them. Tip 9: In order to be a successful coach, you must know how to make your tennis classes interactive and fun to come to. You can do this by teaching a new lesson at each tennis session. Tip 10: Since you are coaching beginners, expecting them to play a full-fledged game may not be possible. Therefore a modified game is what you should can conduct.